Enchanted Rock is one of the most aptly named destinations in Central Texas; this place is truly enchanting. 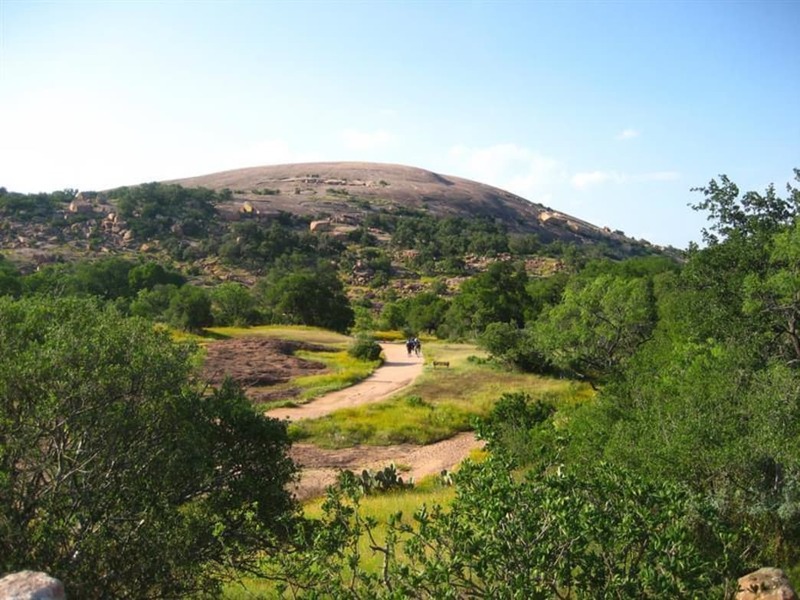 The dome itself is a pink granite mound that rises 425 feet and gives visitors amazing views of the surrounding Texas hills 1,825 feet above sea level. 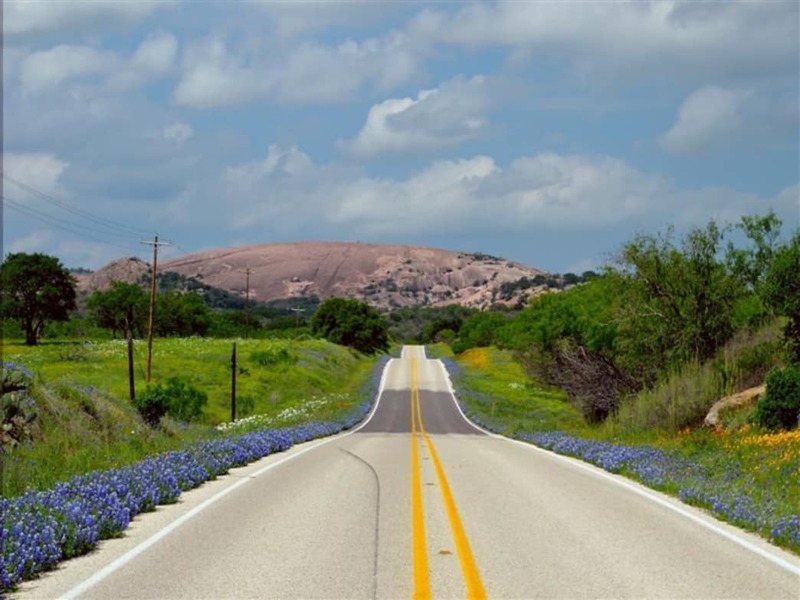 Whether you're a climber, camper, geology geek or day hiker, this place is easily one of the best destinations you can visit in all of Texas. This vast granite outcropping, fondly called “E-Rock” by locals, is sure to enchant anyone who visits just as it enchanted the Tonkawa Native Americans with creaking sounds, caves, and “ghost fires” on top. The 1600-acre park, with its granite dome, circumferential trails, and various small lakes, is simply an outdoor playground. 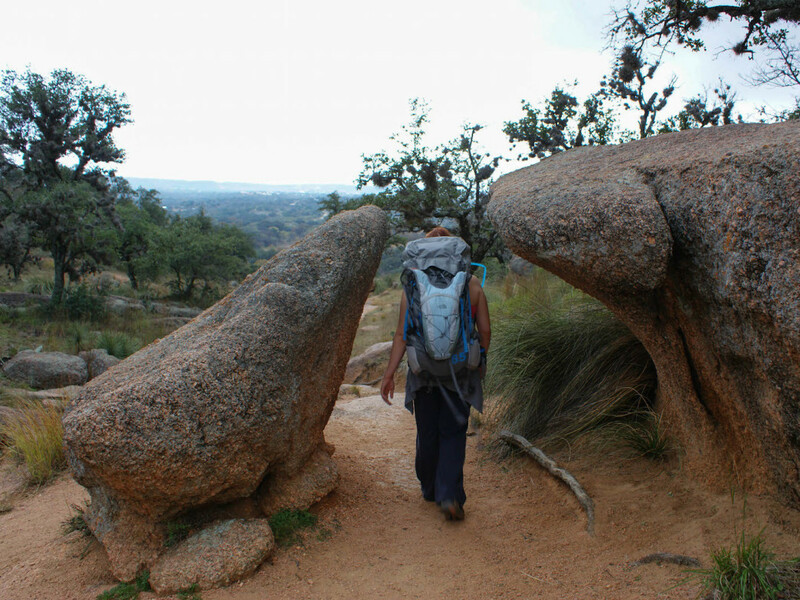 Climbing at Enchanted Rock ranges from top-rope, to trad, to bouldering. The granite is a beautifully pink, conglomerate rock but is not for the faint of finger, so bring your climbing tape. Cave Crack (5.7, trad, 100'), Top Choice (5.10-, trad, 1 pitch), and A Pool With No Bodies (V1 ) are three of the best-rated routes. Plan to start early and be sure to have some water and sunscreen. You might also want to bring along some snacks and a camera. 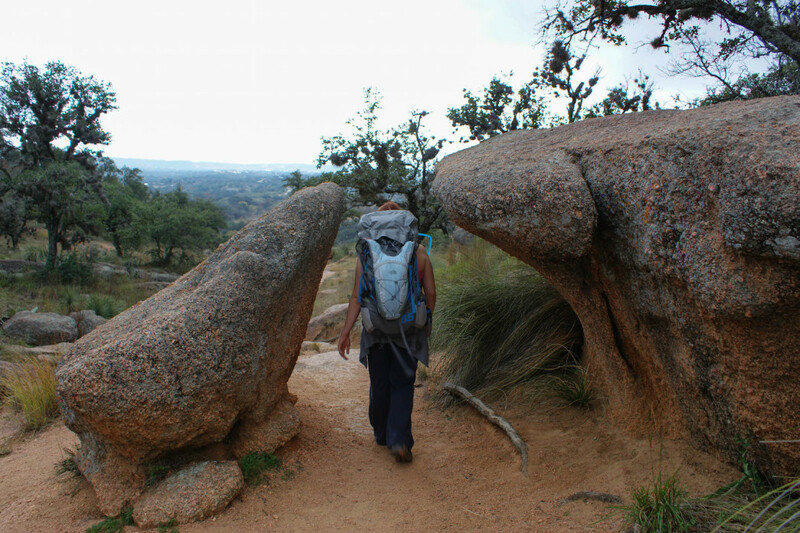 The hiking around Enchanted Rock is variable and the trails are not long. You can choose to summit the dome, which will take about an hour and will require some steep inclines, or you can take the Loop Trail that circles the dome and is about 4-miles long. The scenery and rock formations along the way are beautiful and interesting and it is easy to take your time and get lost in the wonder of it all. The large dome has a cave on the Northwest side that's worth investigating but consider bringing a headlamp. In the winter months, the cave can be icy. Star-gazing is a popular activity as Enchanted Rock earned the International Dark Sky park designation. You can monitor the darkness of the sky at night on the Texas State Park’s website through their Real-Time Sky Darkness Monitoring widget. 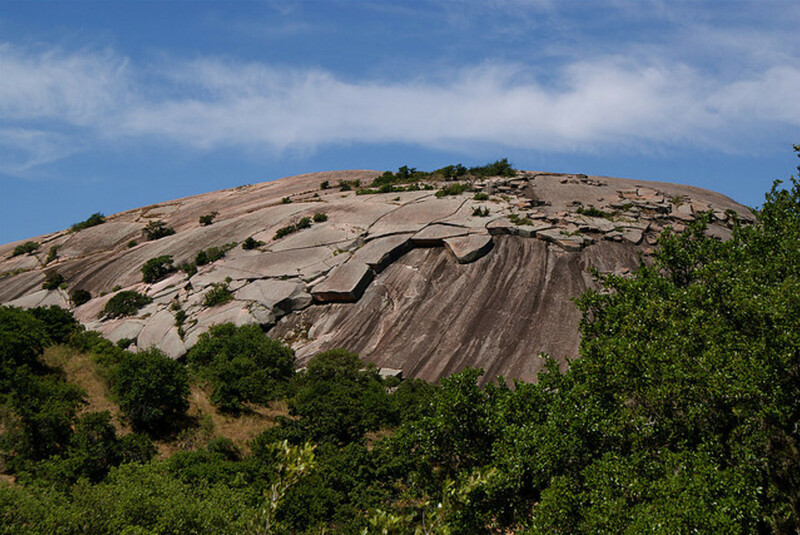 Climbers, hikers, stargazers, bird watchers, geology lovers, campers, and the like will love Enchanted Rock for it’s diversity of activity and delightful views. In particular, E-Rock attracts climbers and star gazers. Make sure to evaluate your skill level before hiking the dome; the 425 foot ascent is challenging for those not used to the strenuous nature of hiking. The climb is the equivalent of climbing a 30 to 40 story building. Camping locations fill up quickly so make sure to make reservations early. Photographers will not lack in opportunities for great shots on this immense exfoliation dome. Geology lovers will rejoice at the history of the dome as it was formed a billion years ago by a large pool of hardened magma which turned into granite. Open daily with a $7 day use fee. There are 35 walk-in campsites, 20 primitive sites and 1 group primitive camping site. Dogs are allowed on leash in the park.